This weekend I had a chance to pull together cards for the watercolor images I did at the hospital earlier in the week. I think this is my favorite. When I originally stamped the images mostly on scraps of watercolor paper, I did a couple of them too close together on this one strip of paper. So I had to tear it diagonally to preserve both images. One of those created an interesting place to stamp the greeting in Versamark and then emboss in white embossing powder. 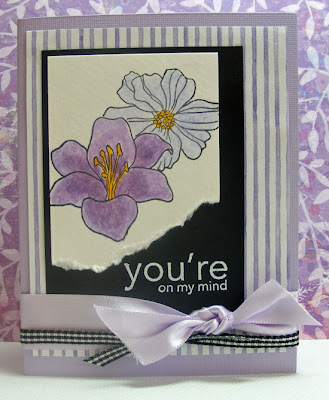 I love to put purples and black (or grays) together in my wardrobe and in cards. It isn't seasonal and has a bit of extra class. Tomorrow we'll see the last of these cards and hopefully a link to a great video on masking. I just have to chase it down on YouTube. other papers are from unknown sources.